The repeated Attack on Titan promotions not only proved to be successful with customers, but beneficial to the fast food chain. With that, Lotteria has scheduled yet another launch to their AoT collaboration, set for April 25th. 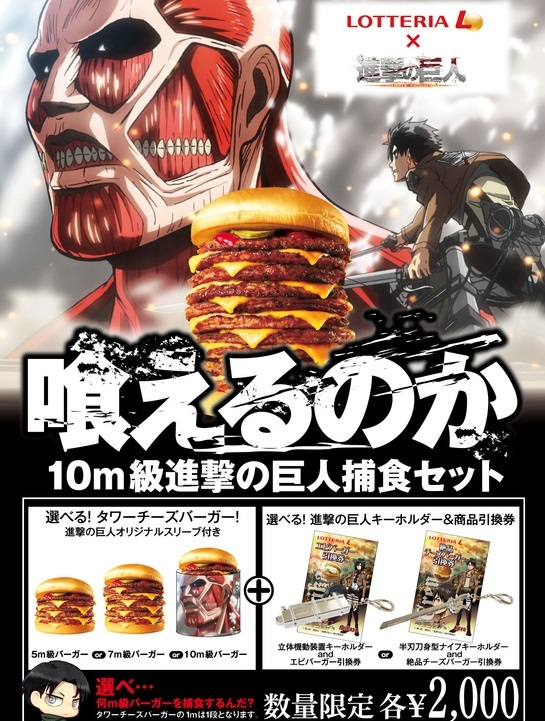 Customers, or “fan-customers”, can expect to collect additional Attack on Titan merchandise with the purchase of a cheeseburger or teriyaki burger, along with a small drink and fries. This will give them the opportunity to receive a Eren & Taichou Levi clearfile or a Titan mini towel. But the true question remains: will fast-food chains, such as McDonalds & Subway, follow the strategic business procedure set up by Lotteria? They’ll be able to provide the Titan meal experience to millions of fan customers, on a global scale. Or would that approach simply be over-glorifying Attack on Titan as a whole? Let us know! Lindo Korchi is the newest staff writer here at Anime Diet. He began his journey into anime journalism in mid-2013 writing for Anime Expo’s news site. Since then, he’s covered conventions, conducted industry interviews, and has written for many Japanese pop cultured outlets, including Tokyo Otaku Mode. Interesting…Lotteria going for “supersize me!” with Attack On Titan collaboration? First time I saw Krista wearing low cut shirt uniform, and despite the fact that she is short, I’m surprised that she has fair size of oppai… But why Levi is also wearing low cut shirt, which makes me nauseated?